Now that we can power our BeagleBoard through the expansion header (http://papermint-designs.com/community/node/223), it is time to go a step forward and power picoFlamingo on batteries. Using the expansion header we can easily include the batteries inside the case to power the system and keep it pretty small. But, what is still missing, is a way to make the system aware of the battery charge. We would need some analog inputs to achieve that goal but, unfortunately, the BeagleBoard doesn't have this kind of inputs (BeagleBone users lucky you :). So we came up with the idea of using an ATtiny85 microcontroller for that purpose. The ATTiny85 is inexpensive, small, power efficient and easy to program, being perfect for our purposes. 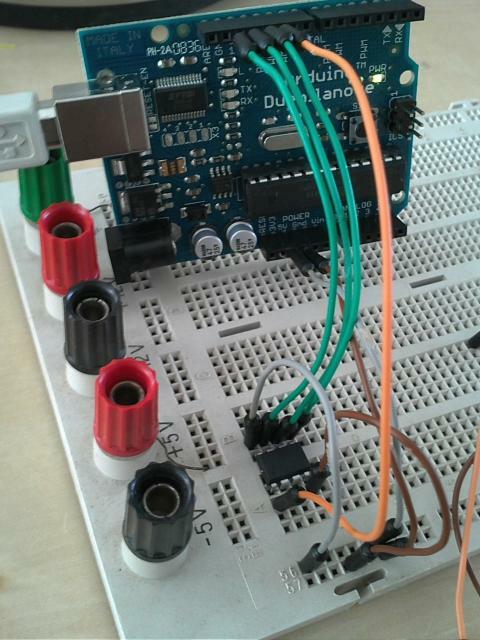 We use Arduino as ISP to program the ATTiny85 following the well-known instructions from MIT Low-High Tech website (http://hlt.media.mit.edu/?p=1695). Just follow the instructions there and do not forget to change the delay(40) to delay(20) in the ArduinoISP sketch as the instructions says (that is for Arduino SW 1.0). The sketch we wrote was very simple. Read all the available analog inputs (3 for the ATtiny, actually they are 4 but we left AIN0 just in case we want to also transmit data through the serial port later on) and send the data through a SoftwareSerial channel. The idea is to use the UART02 on the expansion header to get the data in the Beagle (http://papermint-designs.com/community/node/218). 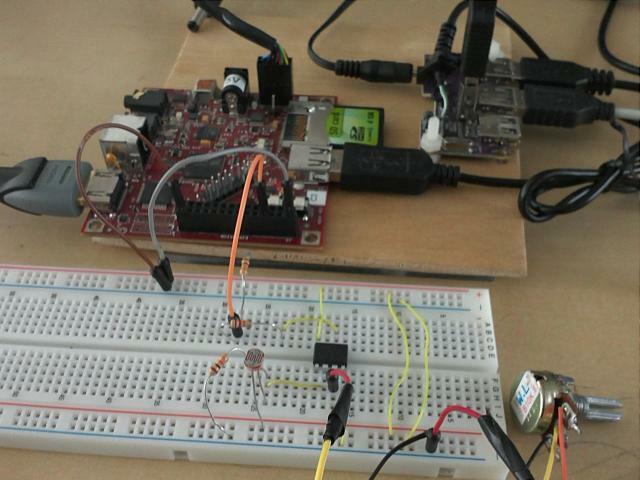 In order to use the SoftwareSerial library, the ATTiny85 needs to run at 8MHz (no need of external oscillator tough). You can easily select this configuration from the Arduino IDE. We quickly tested the sketch with our FTDI Breakout Reloaded (http://papermint-designs.com/community/node/212) and minicom, getting the data as expected. Next step was to write a small application that reads data from the serial port, parses the string coming from the ucontroller and translates them into picoFlamingo useful commands. For that, we started with the great arduino-serial-c from this page (http://todbot.com/blog/2006/12/06/arduino-serial-c-code-to-talk-to-ardui...) and made a minimal modification to the code for the -r (continuous read) command line flag. The change is very simple. Just read one line from the serial port, parse it with sscanf and send picoFlamingo commands to stdout so we can redirect them to picoFlamingo using netkitty (http://www.papermint-designs.com/dmo/prj-netkitty.html) or netcat. The commands sent rotate a 3D model named model and updates a text item named val. First, you can use other uControllers with more capabilities and interface to them very easily through the BeagleBoard UART02. We could also use the I2C bus for the data interchange but that requires a logic-level translator. The serial port can be used for transmission with just two resistors. This selects the 1.1V reference by default for the ATTiny85. The 2.65V is not supported in the Arduino IDE for this uController, however it can be activated using the number 3 as parameter for the analogReference function. It looks like you have a separate rail powering the 85 there. Is it a 5v or 3.3 v? The data sheet seems to indicate you could use 3.3v. Thanks for the idea here though. I'm putting a beagleboard into a dog shaped robot. A dog shaped robot sound very interesting... Is there a website to follow the project?